The default banner title for the SAS Logon Manager is SAS Log On. To change the banner title, use the instructions below depending on your SAS release. Follow the instructions for Changing the Banner Title in the SAS® 9.4 Intelligence Platform: Middle-Tier Administration Guide. Note: Only the banner title can be changed. You cannot change the title in the browser. Log on to SAS Management Console as an unrestricted user, or a user that has access to the Configuration Manager plug-in. Navigate to Plug-ins ► Application Management ► Configuration Manager. Right-click SAS Application Infrastructure, and select Properties. Enter Logon.Title for the property name and enter a value. Restart the web application server. Determine how many property files you need to edit. The property files are localized, so there is one property file for each language that is supported. Typically, you need to edit only those files that match the languages needed by your users. The title values are stored in the messages.properties and messages_<locale>.properties files in the location below. Rebuild and redeploy the Web Infrastructure Platform 9.4 web application using the instructions from the SAS 9.4 Intelligence Platform: Middle-Tier Administration Guide. Note: The properties files might be overwritten by updates such as hot fixes or maintenance releases. If so, you must repeat the steps above. Changing the banner title of the SAS Information Delivery Portal. 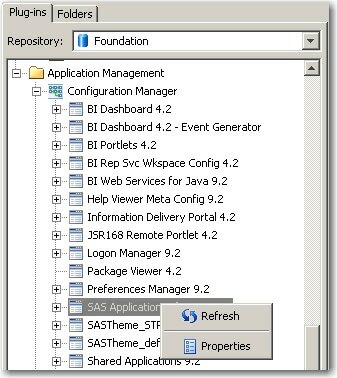 "Customize the Product and Browser Window Titles for SAS Web Report Studio" in Configuring SAS Web Report Studio.